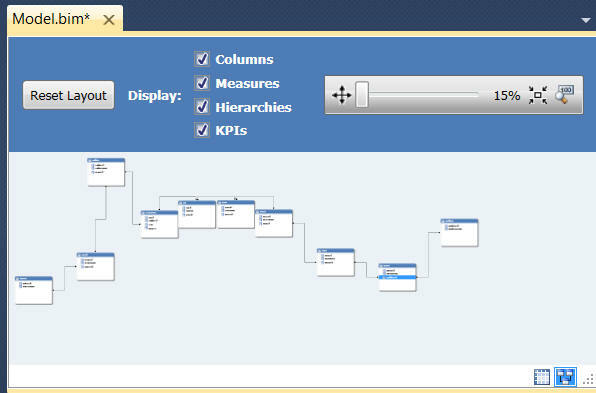 When you first see your data model, it will be in diagram view. At the extreme bottom right of your model are two tiny icons! Use this menu to switch between the two views. Click on a table to see its rows. Diagram view is described below! Click on this tool at the top right of the diagram to fit all of the tables into one screen. Sometimes the tables can then be hard to see! 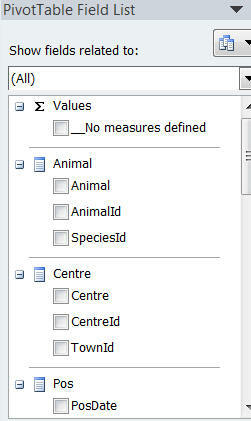 Here SSAS tabular has had to zoom in to 15% to fit everything in the window. Click and drag to zoom in/out. 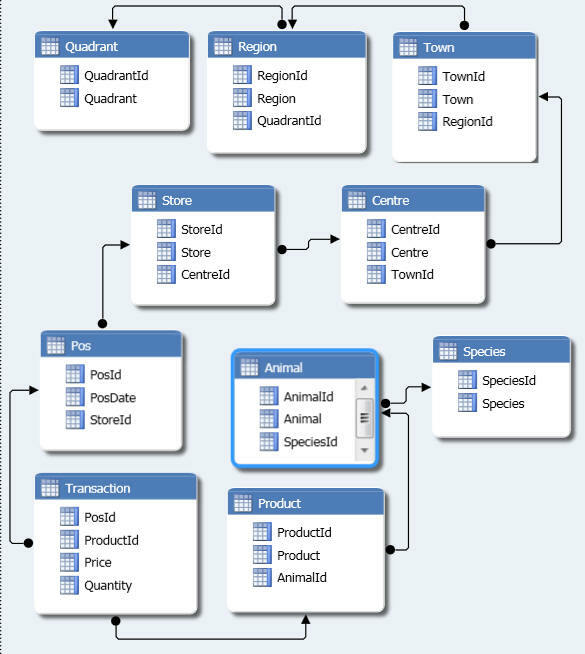 SSAS Tabular will only link two tables if there is a relationship between them in the underlying data source; otherwise, you'll have to create a relationship yourself. 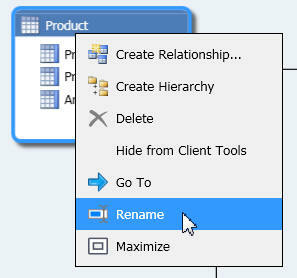 Here I've shown deleting a relationship created automatically, just so that I can show recreating it! Here we're re-linking the Store and Centre tables by the CentreId column. Unnervingly, it doesn't matter which way round you drag (either from the parent Centre table to the child Store table, or vice versa). SSAS tabular will work out from the data in each table which is the parent and which is the child, and display the relationship accordingly, as shown below. 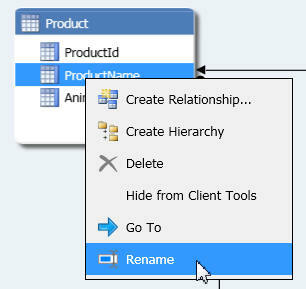 In SSAS Tabular, relationships point from the child to the parent table. 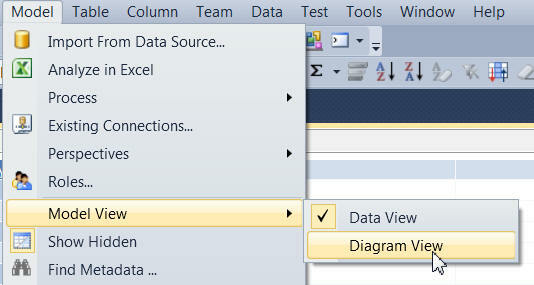 To rename a table in diagram view, right-click on it and choose the option shown. 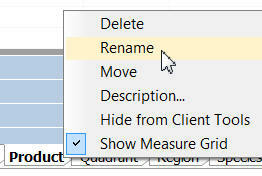 In grid view you can rename a table in much the same way (just right-click on the table's tab and choose Rename). In grid view you can right-click on a column to rename it. 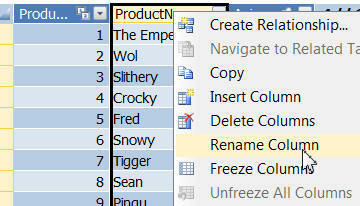 You can right-click on a column to rename it using this menu in diagram view. In the diagram shown below, we've removed the Name suffix from every field (Product is easier to read than ProductName). The tables look reasonably tidy, and both the tables and their columns have sensible names. Most of the columns shown here are of no interest to users of our model - we need to hide them. To see how to hide tables and columns, read on!